ThatGalJenna: Drum roll please...it's time foooooor...Thrifty Thursday! Drum roll please...it's time foooooor...Thrifty Thursday! Well ladies and gentlemen, it's that time again, and because Blogspot is in fact functioning as it's supposed to I can post my cost effective and fabulous Thrifty Thursday today! Woo hoo! This is BY FAR one of my favorite tutorials I've found online and my vow to myself is whenever I close on my new place (once I am officially under contract!) I will make this because I love it to bits! So please enjoy and check out Every Day Mom Ideas for this and so many other craft ideas! Today I would like to share with you all our newest craft. 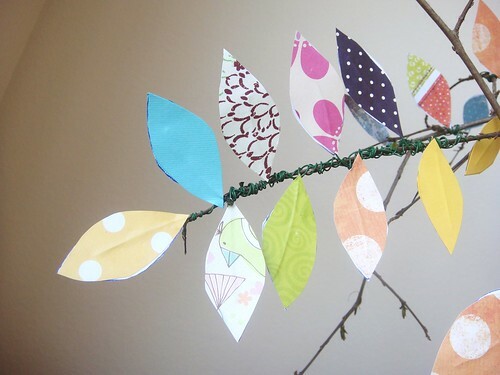 It's a fun and easy DIY Spring scrapbook paper tree. 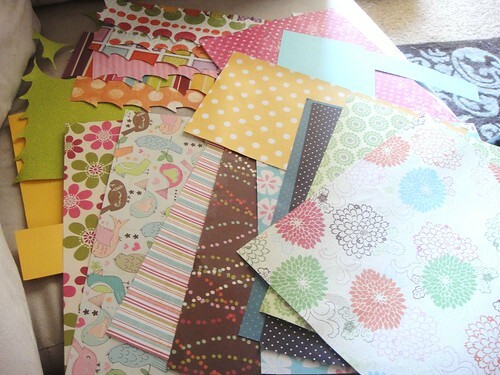 Tristin and I both love scrapbook paper. We love the large variety of gorgeous patterns to choose from and the lovely, convenient low prices (so you can indulge when needed). But the funny thing is, neither of us like to scrapbook. 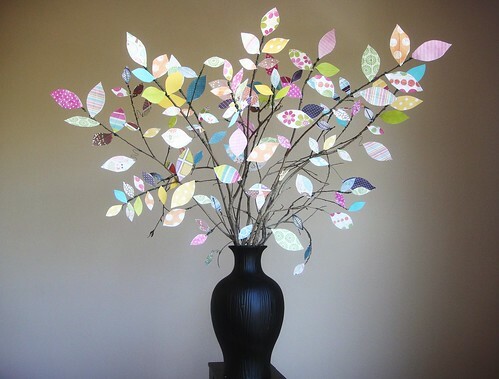 We are constantly searching for new and innovative ways to use scrapbook paper. Today's feature project is one of them. 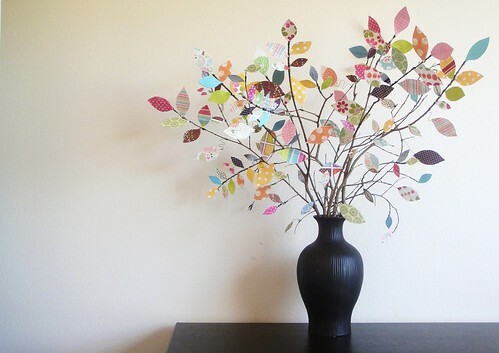 This simple project uses scrapbook paper leaves to create a bright and cheery Spring ambiance for your home. You could also use these beautiful trees in a wedding, baby shower, bridal shower, birthday party... the possibilities are endless! The awesome thing is - you probably already have most of these supplies on hand. I only had to purchase the floral wire for a little over $1 (with a coupon). What an inexpensive way to bring Spring into your home! First, drag out your unseemly healthy assortment of scrapbook paper scraps. If you don't (yet) have a unreasonable amount of scrapbook paper (and everyone should), then just head over to your local craft store - Jo-Ann, Hobby Lobby, or Michaels and pick out your favorites. 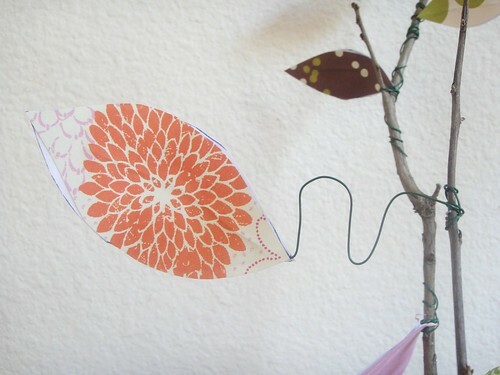 Cut out a template of your leaf from the cardboard (you can also use chipboard or card-stock). I used two different sizes of leaves - one small and the other a lot larger. Try to make the leaves as symmetrical as possible (which I did not realize until later). This will help with pairing up a back and front leaf later on. Using your template, cut out as many leaves as you want. Cut them in even numbers because, again, you will be pairing them up later on. Take your floral wire and cut strips anywhere from 5"-8" long. I know that's a big range, but I'm taking into account the different size leaves. 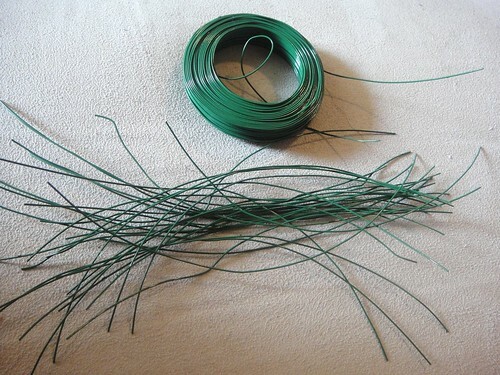 If it's a larger leaf, you will want a few extra inches of wire. Lay down some newspaper next to your workspace. Take one of your leaves and put a thin strip of glue down the center. Place a piece of wire on the glue. 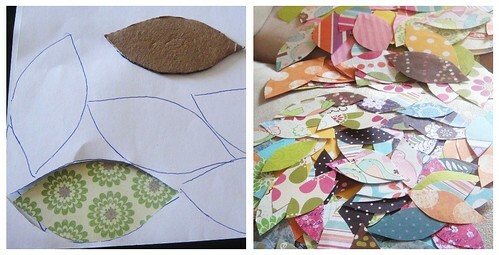 Find a leaf of the same size and same scrapbook paper (or different paper- this is your project!) and place it on top of the glue, sandwiching the wire and forming a "vein" down the center of the leaf. Place your newly made leaves on the newspaper. Keep going until you've made all of your leaves. And you're done! This project is so easy. You can make a huge tree or just make a small, simple one. Do ten of them for an event, or just create one for your humble abode. Either way, take this idea and run with it. You can create some Spring magic using only a few supplies! So that's it! What do you think, do you think you'll try it out? This project just makes me smile inside and out (maybe because it's a plant that is lovely and that I can't kill...shhh!) I'd love to see it if you try it! That is really cool, I love it! Wonderful blog and tutorial, Jenna. This is great! I am so using my cricut to cut out leaves! Lol. This is so fresh and springy--and easy to change with the seasons. Love it! Very nice, I might make one of those for my new house! I have a blue little table that needs something special! Thanks! This is such a cute project. I think it would make a great house-warming present. I'm so happy you found my blog which lead me to finding your blog - I love it! I have filed this in my "Favorite Blog Post" file. I'm going to make one! I am SO glad you all love this project as much as I do! Hopefully if any of you guys do try this project you share it, I'd love to see it, there are so many possible outcomes to this!